* As per 97/68/EC ISO @ rated speed. Power is provided by a durable and efficient high-torque 3-cylinder Yanmar TNV Series diesel engine. This series of engines was developed to meet environmental requirements for Tier 4 (2025R) emission requirements by featuring lower levels of both exhaust and emissions. * As per 97/68/EC ISO at rated speed. Horizontal exhaust discharges fumes away from the operator station, reducing noise and improving operator visibility and comfort. The 2025R and 2032R hydrostatic (HST) Tractors feature a foot-controlled hydrostatic transmission. 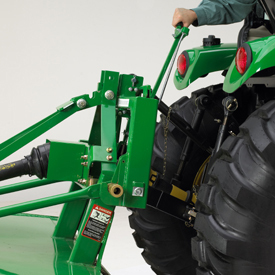 The range lever is located next to the left-hand fender (A), conveniently within reach of the operator. Kanzaki® HST transmission is used for reliable operation. 1) Large forged one-piece trunnion shaft with larger support bearings that reduce vibration and noise. 2) Innovative transaxle combines an HST transmission, gear reduction axle, and clutch. 3) Pressure side filtration allows using a finer mesh filter (10 micron) than suction filtration systems used on many competitive tractors. 4) Charge pump used to deliver oil to transmission (some competitive tractors use one pump for transmission and hydraulics). 5) Oil cooler cools transmission oil for longer transmission life. Kanzaki is a U.S.-registered trademark of Kanzaki Kokyukoki Mfg. Company. The operator's station has been redesigned for greater operator comfort and visibility. Full instrumentation is standard equipment for operating convenience and confidence. Updated seat design offers improved back support for more comfortable operation. Seat adjusts fore/aft for operator convenience. Seat adjustment lever is located on the right-hand side of the seat. The iMatch Quick-Hitch provides easy hookup and a guaranteed fit for all Category 1 implements designed to meet the ASAE Category 1 Standard S278.6 for quick-attach hitches. 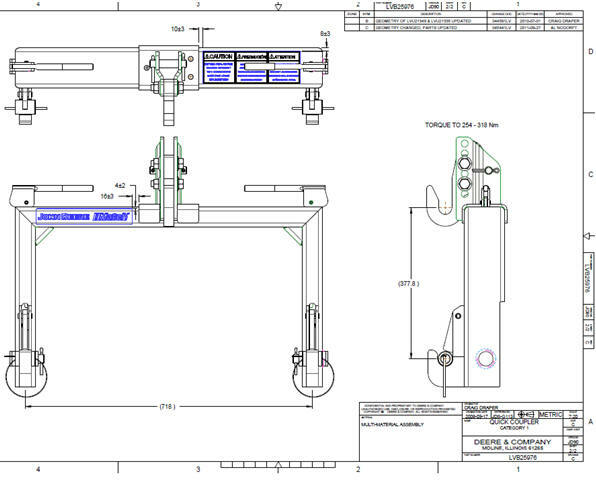 NOTE: In the above picture with the rotary cutter, the bushing set BW15056 is shown. These bushings allow the hooks on the iMatch and the pins on the rotary cutter to fit together properly. All other implements (box blades, tillers, rear blades, etc.) will require a set of bushings to enlarge the pin to fit with the iMatch hooks. 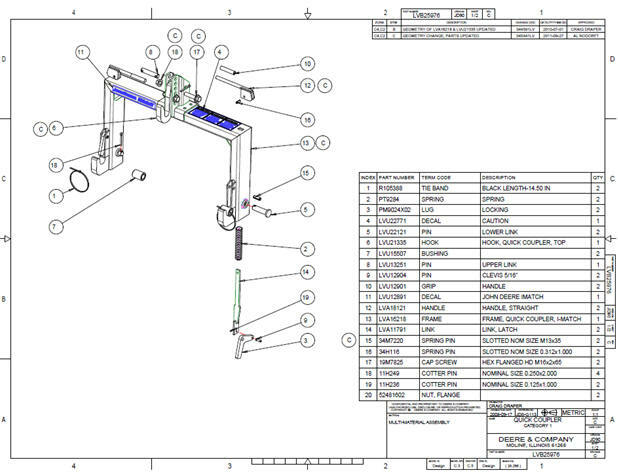 Bushings of different lengths can be found in the parts system or through a bushing supplier (see dimensions below). 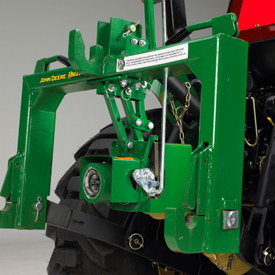 iMatch AutoHitch is the next generation of the successful iMatch Quick-Hitch that allows operators to hook up the PTO shaft of certain PTO-driven implements. This revolutionary system is the first of its kind, allowing the operator to change from a compatible rotary cutter to a compatible rotary tiller without leaving the seat of the tractor. John Deere continues to lead the way with innovative designs that ensure operators can quickly and easily change implements and attachments on the compact utility tractors with no tools and little experience needed. I ordered a 2025R with backhoe and bucket and a 54 inch mower deck. I have had the backhoe rebuilt after a hour of use do to excessive leak down. I would disconnect it and it would just bleed off to the ground making it hard to reconnect even if I tried right after I took it off. The backhoe has no power and will not dig through the smallest roots. Tractor did not have the power to back up a slight incline with a full bucket of topsoil just wouldn't move. The drive on and off mower did not work as advertised when the John Deere mechanic was showing me how to use it the mower caught the bucket stand and bent a number of brackets up front. The neutral safety switch has no light and is hard to get to engage half the time the tractor is killed when you get off when you think you have it engaged. I use this for Grinding Stumps, and other general tractor work. Traded in my 1025R for this one. It is a very great up-grade. Heavier and sturdier, which is what I needed. 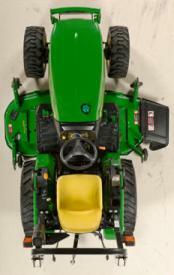 I purchased John Deere 2025R. I carefully reviewed and looked at the 1025R. And must admit i was impressed. Nice little tractor. Loader, backhoe, mower I thought wow what more could you ask for. Then I reviewed and looked at the 2025R. Larger tires, more lift capacity on loader and stronger hoe. I wanted a tractor that could do it all and the 2025R was the one for me. I like the larger tires more stability less tipsy when going though woods to reach fields where I do food plots for deer. I purchased mine with the 130H loader(Quick Attach) and 270A backhoe. (Quick Attach) I LOVE this tractor. I have a 3 point 5 ' finish mower and a 5' brush hog and it handles them with ease. The backhoe has great power and you don't have to take off 3 point to install it. The 3 point is needed to hook it up. That's another key feature over the 1025R. I have nothing against the 1025R it is a bit more fancy nicer seat 12volt outlet storage compartment but the 2025R is more of a work tractor and all those extras could be added if you feel there necessary well worth the extra $$$$. For better lift and stability. I hope this helps anyone that's stuck between the 1025R and the 2025R like I was. But if your still not sure. I never heard anyone say I wish I Bought a smaller tractor. no tool box for pins etc. Owned a 1023E and traded up to the 2025r and it was a very good move. This tractor is the all around package. Small enough to cut grass with, but packs enough hydraulic and PTO power to do most anything I need it todo, from grading, rotary mowing, and seeding. Only found one thing I am a little disappointed with and that is what you have to go through to get to the main drive shaft front U joint grease fitting up by the engine. Wish they would have put the access panel through the lower dash pane, so you didn't have to loosen the whole dash to move it out of the way to get to it, but that is the only thing I have found that i don't care for. I defiantly give this tractor an A+. Great little machine. With 60 hours on my new 2025R I was mowing a pasture with a flail mower on the rear when things went wrong. No belly mower was mounted underneath, and Deere for whatever reason does not install a guard to shield the 4' long propeller shaft that extends from the transmission to the front axle. Grass and weeds wrapped around the shaft building up the diameter until clearance around the shaft was gone. At that point the side pressure snapped off the splined stub that sticks out the front of the transmission where the shaft connects. It's a major repair which fortunately was covered by warranty. But there's still nothing to protect the shaft from this happening again. IMO, this is a serious oversight on Deere's part. What am I supposed to do now, install a mirror so I can keep track of it from the driver's seat? If not for the fact that I own other JD equipment that has served well my rating would not have been as generous. Spent the extra bucks and get the front end loader.You will be glad you did. I have a 26 acre farm and this tractor amazes me everyday. I love this tractor.It has 60 hours right now. My 2025R has 150 hours on it and has spread over 1200 yards of dirt using the bucket and box blade. At times the dirt was wet and very heavy. I have pushed it to the limits and it hasn't failed me once. The drive on mowing deck is also very well constructed and is extremely easy to install and remove. It cuts grass as good as a push mower. This is one quality machine! I have a small horse small ,large gravel driveway I work this little tractor to the limits and it takes everything I give it .I use the front loader with a box blade to the limit.Tactor is very easy to use My wife uses loader like she has ran one her whole life . I have owned my 2025 for just over a year and I can say I am 100% satisfied with the tractor. The front end loader is an absolute necessity and makes the unit twice as versatile as one without the loader. I use the tractor for a lot of different things, light plowing, bush hogging, disking, moving firewood, dirt, gravel and digging post holes. The dealer I have conducted business over the past has been excellent, but when I took the tractor in for the 50 hour maintenance I had one minor problem that I needed fixed. 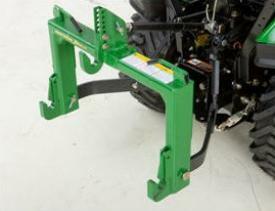 The lift arms on the rear of the tractor were not level, causing the bush hog and disk to cant to one side. Even with the leveling device on the right lift arm cranked all the way up, the implement was still not level. The right rear lift arm needed to be removed and moved one notch down on the spline to correct the problem. The dealer simply put a locking nut on the bottom portion of the lift arm leveling device. Not a fix but I will give it a try. Minor annoyance.